Last Wednesday just prior to the Thanksgiving break, we submitted a range of options ideas on Zillow, which we caught at a relative bottom after noticing some hefty Form-4 submissions. Our targeted options were the Z 01/18 $30-40 Calls, and in the two-and-a-half sessions since we’ve seen excellent multi-bag gain opportunities. 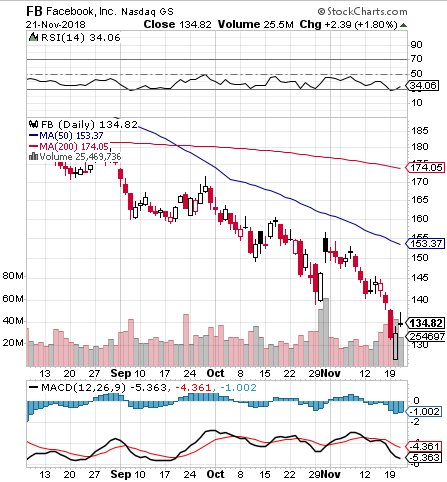 Then on Friday, after the holiday we spotted a bottom play in FB, and jumped on that with another longer term set of options ideas, the FB 01/18 $135-145 Calls. We’ve had some appreciable movement in those as well, and wanted to share those figures. As is the case with the aforementioned plays, it’s a good start, but with plenty of time remaining until expiration, we’ll definitely continue to track these ideas in the days and weeks ahead. With the half day of trading today, and the general subdued sense of the holiday, we don’t expect this session to be full of much excitement, but we have identified an idea that we can watch into next week and possibly beyond. Facebook has been in a downward pattern for several months, and as you can see on the chart below, produced a significant bottom bounce signal. In fact, all of our favorite indicators seem to suggest an up-cycle could be in the cards heading into the new year. For that possibility, we are going to highlight a range of options calls that we can observe and potentially take advantage of in the days and weeks ahead. We’re going to put the FB 01/18 $135-145 Calls on watch, and if the stock can rebound back toward its previous resistance area, those should be in pretty good shape. After a tumultuous month on the whole, October came to a solid end with a very strong performance from the markets, and in effect, a good showing by many of the ideas we presented in yesterday’s report. Take-Two Interactive Software, Inc. TTWO – First we’ll give an update on the calls we made on Tuesday morning for TTWO- the Weekly $122-125 Calls. They started moving immediately, as we mentioned in yesterday’s report, and after another session the gains have piled up even higher. Three of the four fresh options ideas we submitted in yesterday’s report also saw sizable gains on the day. Late last week, we selected a few contracts in the Facebook and Twitter options chains for longer-term ideas. The FB 10/12 $182.50-190 Calls, and the TWTR 10/12 $35 & 37.50 Calls. While they haven’t blown their lids quite yet, we wanted to reiterate our interest in tracking these over a longer time period. We’ll continue to track these ranges, as there is still plenty of time for them to begin realizing their full potential. What we’ve seen to this point may be just the beginning. To add to our social media related options ideas, we also see SNAP coming off of a recent bottom, and will signal the SNAP 10/05 $9 & 9.50 Calls for observation as the stock attempts to mount a recovery of recent losses. With a major category-4 hurricane currently inbound for the Carolina coastline this week, we’re also going to highlight some plays in Home Depot and Lowes Home Improvement, which tend to see surges in the wake of storms big enough to require extensive cleanup and repairs. According to all predictive models, Hurricane Florence definitely fits that bill.